That's Peter's hotrod, People's Choice 1st prize 2011. Click here for a portfolio of Peter's work. Peter is making another Packard for Carl Schneider. 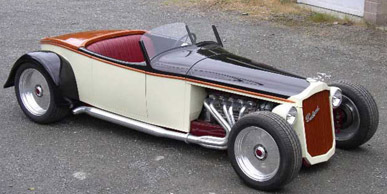 The Speedster was sold at Barrett-Jackson on January 19th, 2007, and immediately resold to the Potts family of Oregon. Peter Portugal, designer-builder of fine automobiles, introduced his latest creation: a ten-cylinder hotrod based on a classic Packard. The amazing one-off car is a masterpiece. This piece of rolling art was built of steel, mahogany and maple by one of the premiere builders of Packard concept cars. His cars have been at Pebble Beach, Meadow Brook, The Packard Museum and on international television. This 1926 Packard is an example of the one-off designs that converted a production sedan into a sports roadster. This type of car bridged the gap between the Boat Tail race cars of the 20's and the production Boat Tails of the 30's. It has a modified Packard frame with disc brakes, coil over shocks and a Ford 9" rear end. the engine and transmission are from a 2005 Viper with less than 500 miles on it. It has the kind of performance you would expect from a 500 HP, 2600 lb. car (5.2 lbs/hp). The extended cab fits tall drivers and is finished in leather, wool & wood. This is a one-of-a-kind automobile and virtually everything on it is hand made for this particular car. At the dawn of the automobile era the focus was on building reliable transportation. Parts such as the frame, engine, hood, and body were connected to one another without much attention to how they related to each other visually. Additional parts, such as headlights, taillight, etc. were attached as needed. By 1912 coachbuilders like Frenchman Jean Henri-Labourdette were developing aerodynamic designs for race cars. His torpedo designs blended the hood into the cowl and continued back to a point.He chose wood (Mahogany) for the body to save weight and put a natural finish on it because he liked the look. This shape became known as a boat tail and by the mid 20's was dominating the race track. Much like the spoilers found on today's passenger cars, this race car concept made its way into mainstream automobile design. By the 30's manufacturers such as Dusenberg, Auburn, Rolls-Royce, and Packard to name a few, were building production boat tail speedsters that were the forefathers of the modern sports car. This 1926 Packard is an example of the one-off designs that converted a production sedan into a sports roadster. It was this type of independent design that led the way for the production boat tails of the 30's. I am an artist who loves cars and have been building Packards for Carl Schneider for a number of years. We cut up production sedans and built concept cars that the Packard company had talked about making but never did. One of these sold for $375,000, another went up to $950,000 at the Kruse auction in 2005. They have been shown at Pebble Beach and Meadow Brook. I converted a 1928 Packard touring car into a European style dual cowl phaeton. It can be seen in the background in the "in progress" shots of the 1926 boat tail. I also recreated a 1929 one-off Packard boat tail speedster that had been built by the TRW company for Lieut. J. R. Glasscock using dimensions scaled from old photographs. It is a great car with a hot Packard straight 8. The down side of that car is that the tires, brakes and steering are not safe at the speeds the car is capable of. That thought, along with a pile of left over Packard parts, led me to the creation of this 1926 Packard boat tail speedster hot rod. It is a car that captures an important part of automobile history, is at home in an art galley, and is really fast. ENGINE: 2005 Viper V10 (500 horsepower - 8.3 liters). DASH: Classic Instruments on birdseye maple dash by Peter Portugal. THANKS TO: Larry Cole, Gene Davenport, Dennis McDonald, Carl Schneider, Floyd Meyers, Steve Simmons, Sue Portugal, my family, and every one else who helped. The Packard Museum auctioned off a 1951 Sega Magazine design Packard, reinterpreted and built by Peter Portugal,for $375,000. Portugal's Packards have been featured in Collectible Automobile Magazine. When we were 10 years old, my twin brother, Peter Portugal, modified our long-outgrown tricycles. He took them apart and put them back together with the chassis upside-down. Suddenly we had long, low, hot-looking vehicles with plenty of leg room, more interesting than our customary bicycles. All the kids in the neighborhood brought their old tricycles for Peter to modify, and we held a series of hilarious tricycle races. Portugal has been modifying vehicles ever since. As a preteen, he rebuilt a couple of scooters and a motor bike. When he was 14, he rescued a Model A Ford that had been sitting in a meadow for many years. By the time he was old enough to get his driver's license, the Model A was running great and looking beautiful. While still in high school, he restored a 1932 Chrysler and sold it at a good profit. Our parents convinced him to study architecture at Cal Poly, because he is a genius at visualizing how things will fit together. But his passion has always been cars. In the 1990s, he designed and built a classic-style sports car, using redwood from a fallen tree in his back yard for most of the body. That car, the Dolphin, was the star of many automobile shows, and was featured in magazines and on TV. Portugal was commissioned by Carl Schneider, a car dealer and Packard classic-car race driver based in Eureka, to envision and build classic automobiles that Packard might have produced as one-offs. The Schneider-Portugal Packards were spotlighted in a cover story in Collectible Automobile (April 2002), and one was sold by the Packard Museum for $375,000. Schneider turned down a $950,000 offer at the Kruse Auction last year for another of Portugal's creations. Others have been successful on the vintage racing circuit, and have been shown at Meadow Brook and Pebble Beach. All of Portugal's cars would be equally at home in a car show or an art gallery. Now working in his own studio, Portugal has created a 1926 Packard Boattail Speedster, which will be unveiled at the Back to the '50s Sock Hop and Car Show sponsored by Golden Gate Street Machines Unlimited July 15 in San Carlos. It will be auctioned by Barrett-Jackson in January unless someone makes a substantial offer before then. Portugal started with a cowl (the part under the windshield, between the doors and the motor) from a 1926 Packard, and from there built the speedster. In the early 1920s, when automakers first attempted to streamline automobiles for racing, the first feature they used was the boat tail. Portugal put a boat tail on his speedster and enhanced it with a redwood deck lid. Portugal said that he "built the speedster to look old, but upgraded the steering and tires to make the car more drivable." From there, I thought I might as well make a hotrod, so I put a modern engine in it. It has modern headlights, taillights, transmission and a huge engine - a 2005 10-cylinder 500-horsepower Viper. It's really fast." I spent six years developing my concept of what a vintage style sports car should be, and bringing that concept to life. It was my desire to build a car that was equally at home in an art gallery, on the open highway or on a winding road. The Dolphin is the realization of that dream. It is a combination of the wooden bodies used on some of the great early racing cars, with the style of the mid-1930's as it was refined by such coach builders as Figoni and Falashi. Add to this, wicker seats similar to those used in early racing airplanes, the vintage sound and feel of an in-line six cylinder engine, and the precise feel of rack and pinion steering. The result is a feast for your senses. The picture is of the prototype. I am taking orders for automobiles at this time. The vehicles are hand-made and each car will reflect the new owner's design preferences and desires. The construction techniques make it possible to offer a wide variety of engine and body alternatives. The body of the prototype is hand crafted from a 250 year old redwood tree that fell down in a wind storm in 1981 and missed my shop by about 80 feet. The trim is bronze and brass. The wicker-backed seats are upholstered in soft leather. The Dolphin won Best of Show in its first appearance after completion. A sporty convertible with retractable hard top is completed, and was be at the Palo Alto Concourse this summer. A European-style GT is almost ready to be shown. A woody station wagon is under construction now. The projects are sponsored by Carl Schneider of Eureka. Occasionally the best vehicle at a kit car show isn't available as a kit. Sometimes it's a handcrafted custom, a conveyance so unusual, so rarefied, that it's simply not possible to offer it in component form. This was the case at the Northern California Kit Car Club's (NCKCC) annual mid-September show in San Leandro, California. .
What was the non-kit-car show winner mentioned at the outset? We'd seen it partially assembled at the Knott's show, but that preview didn't prepare us at all for the completed car. The Dolphin, aptly named for its flowing flanks, features a body lovingly crafted out of redwood--yes redwood, all sealed with epoxy resin and S-glass cloth. Wooden bodies were used on some of the great early racing cars, but such old-world craftsmanship is just too rare nowadays. Sculptor Peter Portugal has the talented pair of hands that rendered this work of art. Reproductions of the vehicle are available. Not only did Portugal capture Kit Car's Best of Show Trophy, he also received the same award from the NCKCC. We don't expect to see wooden kits popping up in great numbers, but such exclusivity actually adds to the Dolphin's appeal. The leaders of the Monterey Bay Rolling Concours last night sounded like a den of dangerous animals: vipers, cobras, stingrays and jaguars. . . .
"It would be nice to say once you've seen one red Ferrari you've seen them all, but here's another one going by," said Miller as a Testarossa passed the reviewing stand. . . .
Perhaps the most exotic car in the parade was a creation by Peter Portugal of Eureka, which he calls the Dolphin. He attracted an admiring crowd as he lifted the polished wooden hood of the car, which took him six years to build. "It's made from a 250-year-old redwood that came down in a windstorm in 1981," he said. "It landed about 80 feet from my shop." Portugal, an architect and artist, tapered strips of wood to create a rich brown body for the car. It has a hardwood luggage rack, brass and bronze trim and wicker-backed seats. Despite its elegant appearance, he said he drives it on dirt roads in Eureka. "I hope to take orders for more," he said. "They shouldn't take that long to build now that I have the design." Here is a two-minute QuickTime video of Peter's interview on KTVU. Also, Peter and the Dolphin were on The Learning Channel (TLC) Saturday, May 10, 1997. The Show was called Understanding. This episode is called Cars, narrated by Jane Curtin, "Automotive pioneers."